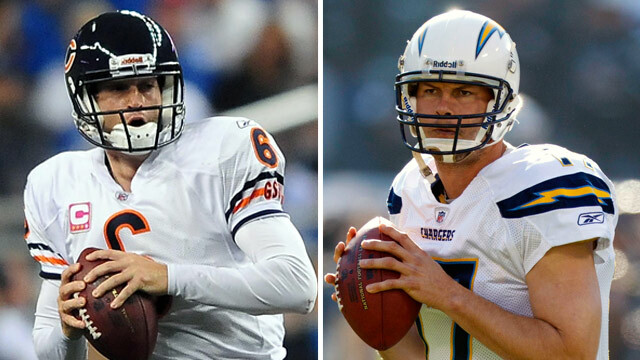 Published: Feb. 8, 2012 at 10:48 a.m.
Jay Cutler (left) and Philip Rivers missed the playoffs last season, but both lead teams on the verge of success. The Giants did not make the playoffs in 2010 ... and then won the Super Bowl the following season. You know what's coming next. Of the 20 teams that missed the playoffs in 2011, which one has the best chance at taking home the Lombardi Trophy at Super Bowl XLVII next February in New Orleans? As long as Philip Rivers is their quarterback and as long as they're playing in the AFC West, the Chargers have a shot. I can't see them missing the playoffs three years in a row in that division, even if Vincent Jackson departs. Their division could be even more pedestrian next season. They need to get it right in the draft and re-fortify both sides of the line. But we know they can get hot -- we've seen it before. Now it's a matter of them getting hot late and sustaining it through the postseason. I came close to going with the Eagles here, but I'm just not sure they can keep Mike Vick healthy for 20-odd weeks (including playoffs), and I don't see them getting it done with Mike Kafka or Vince Young, should they re-sign him. If Jay Cutler stays healthy, I'm rolling with the Bears. Chicago was really gaining traction before Cutler got hurt, even with a serious lack of big-play receivers and issues on the back end of the defense. With Phil Emery now in charge of football operations, I believe they'll take care of running back Matt Forte contractually and finally get Cutler some needed receiving threats. Brian Urlacher and Lance Briggs don't have much longer to seize the opportunity to win a Super Bowl. Neither does Julius Peppers. The Bears will have a tough charge to get to the playoffs with Green Bay and Detroit in the same division, but with Cutler on the verge of entering star status, they have to be viewed as a legit threat. The Dolphins were my preseason sleeper pick to reach the playoffs this year, so I'll go with them one more time. The defense is fantastic, as it allowed the sixth-fewest points per game in 2011 (19.6). There are some nice pieces on the offensive side, too, with Reggie Bush turning it on, Daniel Thomas showing promise and Brandon Marshall being a legit No. 1 target. And of course, Miami is one of the rumored destinations for QB Peyton Manning. This team has a huge chance to make a Super Bowl run if that happens. The defense is good enough to have them playing deep into the playoffs no matter who the quarterback is. The NFL sure is set up for a team to come out of nowhere to win a Super Bowl. In my book, three teams to have the best chance to be next year's version of the 2011 Giants. I like non-playoff teams that finished strong as an indicator they may be on their way to a big 2012. The Eagles and Chargers both finished 4-1 down the stretch and have a chance. Time is running out on Mike Vick, so it may be now or never for him and the Eagles. The real dark horse in the race may be the Carolina Panthers, with a 3-2 finish and an emerging star at QB in Cam Newton. I think the Bears could have been in the Super Bowl this season if Jay Cutler didn't get injured. They finally put Cutler in the best position to win midway through the season and they went on a roll until he broke his thumb. The defense is still very good and can dominate as long as it's not asked to do too much. We talked a lot about how, being hurt, Peyton Manning was the real MVP, but how about the Bears without Cutler and their visit to Nosedive City?